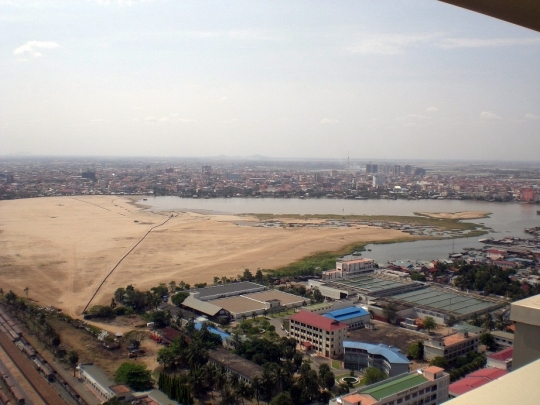 The municipality of Phnom Penh is not only forcibly evicting communities from land, it is also removing 90% of the city’s major lake to build luxury apartments and hotels. To do this, water and silt are being pumped into Boeung Kak Lake, purposefully flooding nearby homes in several feet of murky water and causing other homes to collapse into floodwater. Approximately 20,000 people are effected. I visited Boeung Kak Lake soon after the large pipe began dumping water and silt into the lake. Where ever I travel, when I explain what is happening to Boeung Kak Lake and to the residents around it, no one can imagine how a government can justify flooding its people out of their homes. The situation is almost unbelievable. The extent to which the government will go to carry out this construction can be seen in this video from WITNESS partner, LICADHO: $79 million for who…? A World Bank-funded project initiated in 2002 sought to improve land rights for so many Cambodians left without documentation after 25 years of civil war. The 15-year, US$28 million project would demarcate land and adjudicate disputes to determine land ownership. Residents living near Boeung Kak Lake were part of this project. This week the World Bank responded to the findings of an independent inspection panel charged to investigate a complaint filed by NGOs working on behalf of Boeung Kak Lake residents. The inspection panel asserted the World Bank mismanaged the project. In particular, the inspection panel cites that more than 4000 families or 20,000 people residing near Boeung Kak Lake were denied due process to have their land title claims sufficiently considered. Half of whom, an estimated 10,000 people, have already been forcibly evicted against World Bank’s policies. As a result of the complaint, the World Bank publicly admitted that mistakes led to housing violations. The Bank has committed itself to engaging the Cambodian Government and the relevant donor countries/agencies in an attempt to address the grievances of the Boeung Kak Lake residents and other communities at risk of forced evictions that were part of the project. The Bank also reiterated the call it made in 2009 (then alongside 7 donor countries, the United Nations and others) for a halt to any further forced evictions in the country. If the Government of Cambodia continues not to cooperate, the World Bank will review its lending commitments with the country. For years, communities living near Boeung Kak Lake have lived under intimidation and with threats to accept compensation far below the market value for their homes. Recent protests for the rights of the resident near Boeung Kak Lake (like the one in the video from LICADHO above or this one from BingSpotter) have become more regular. On 2 March, the municipality issued a fresh eviction notice for several communities near Boeung Kak Lake. Although this government’s deadline has since been extended, the threat of loosing everything looms each day. Take action with Amnesty International and write to the Government of Cambodia demanding not to forcibly evict families living around Boeung Kak Lake.  Archived in Forced-Evictions and tagged boeung kak lake, cambodia, Forced-Evictions, LICADHO, World Bank. The units have been completed, but have yet to be delivered to the buyers. They now claim that they were led to make a “wrong and unfruitful investment’ by MK Land Holding Bhd, and its subsidiary Segi Objective (M) Sdn Bhd. The development is part of the integrated Bukit Merah Laketown resort which includes a water theme park, resort, hotel and service apartment. The buyers filed the suit at the Ipoh High Court in April through the firm of A Saravanan and Associates. They want the court to nullify the sales and purchase agreement (SPA) which they signed with Segi Objective and declare it ab initio (not legally binding); to nullify other related agreements; and to order the defendants to bear costs incurred by them with financial institutions. The buyers are also seeking special damages to cover the purchase as stated in the agreement, as well as general and exemplary damages and other costs. In their amended statement of claim, they said they had purchased units in the Lake Town Service Apartment between 2001 and 2005.
registered owner and beneficiary. Two main conditions were imposed for development of the site – it could only be used for construction of apartments, and it should not be transferred or leased without the approval of the Perak menteri besar. However, the buyers alleged that the defendants then made use of a letter dated Oct 25, 1993, which allowed a waiver of the transfer and lease clause. Some time in April 1995, Segi Objective leased the whole property to Ambank Bhd. On Nov 25, 2000, the leasehold status was revoked and the land was given back to the Perak Land and Mines Office. Up to the time the suit was filed, the office had not demarcated the site for development. The buyers claimed that the defendants had misrepresented the facts, resulting in the units being sold at a time when the second defendant was not the legal landowner, since it had surrendered the site to the Perak Land and Mines Office. Segi Objective was not in fact the developer of the project as it did not have a licence to do so, they said, naming the actual developer as Vibrant Leisure Sdn Bhd. The buyers listed 23 instances of alleged fraud. Among these was alleged failure to inform the purchasers that the land had been returned to the Perak Land and Mines Office in 2000; that the sales were conducted before demarcation of the property; and that the second defendant had wrongfully used the land to secure a loan from Ambank Bhd. The buyers further said the Perak Land and Mines Office had, some time in November 2008, amended the structure plan, and that this had not been approved by the Perak Urban and Rural Planning Department. Their check with the National Housing Department showed that Segi Objective did not hold a licence to build the project. Some of the buyers said they had been blacklisted for failing to keep up with installment payments. They are in a double bind because they cannot sell their units because these do not have the same market value as at the time of purchase. They said they have yet to receive a certificate of fitness and strata title for the units. MK Land and Segi Objective, in their statement of defence, claimed the suit is frivolous, vexatious and an abuse of the court process. Segi Objective claimed that when it sold the units, it was not governed by the Housing Developers Act (Control and Licence) for construction of service apartments. Also stated was that Bukit Merah Laketown was solely developed by Segi Objective and not MK Land. The defendants claimed that the plaintiffs’ arguments of misrepresentation, wrongful fact, failure, faults and breach of contract were without basis, relevance and wrongful under the law. They alleged that the plaintiffs have no locus standi (legal standing) to file the action as they had surrendered their rights, ownership and their interests in the properties, as stated in the SPA, to financial institutions. Should the court decide that the SPA is not legally binding, then the plaintiffs should return whatever income they have received in rental over the years from Segi Objective or Bukit Merak Resort Sdn Bhd, the defendants said. MK Land has filed an application to strike out the suit on the grounds it is not the rightful party in this action and that it has not entered into any SPA with the buyers. In his affidavit-in-reply, plaintiff Mohd Nordin Surat claimed MK Land did made a representation to them and the buyers’ trust was based on MK Land backing the project, and not Segi Objective. The application to strike out the suit will be heard some time this month.